To mark the 50th anniversary of the Warren Commission report, the Washington Post published a slanted, confusing and needlessly complex retrospective in its Sept. 21 Sunday Outlook section. The column Meet the respectable JFK conspiracy theorists by author Philip Shenon ignored many major revelations of the past half century regarding the 1963 murder of President John Kennedy. Instead, it focused on minor matters to conclude, once again, that the Warren Commission correctly found that alleged assassin Lee Harvey Oswald acted alone to shoot the president with three shots from the rear. Yet there are many well-credentialed experts who can explain in simple terms the serious questions remaining about the Warren report -- if not flatly contradicting its conclusions. The Assassination Archives and Research Center has organized an event from Sept. 26 to 28 at the Bethesda Hyatt Regency Hotel “The Warren Report and the JFK Assassination: A Half Century of Significant Disclosures." It features nearly 50 speakers including me, plus professional actors re-enacting key parts of a long-hidden meeting of the commission. 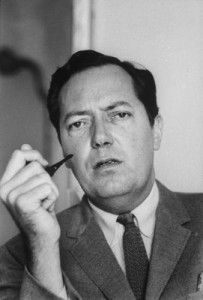 In 1967, the late New Orleans District Attorney Jim Garrison, shown at left, shocked the nation with his blunt, eloquent argument that the Warren Commission and the major media had misled the public about the cause of the killing. Garrison ascribed the murder to a conspiracy of well-connected zealots determined to change American foreign policy by killing the president. 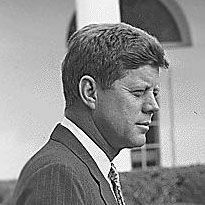 "The conclusion of the Warren Report, that President Kennedy was killed by a lone assassin, is a fairy tale," Garrison said during an NBC News special in July 1967. "This does not mean," he continued, "that the men on the Warren Commission were aware at the time that their conclusion was totally untrue, nor does it mean necessarily that these men had any sinister motives. It does mean that the conclusion that no conspiracy existed, and that Lee Oswald was the lone assassin is a fiction, and a myth, and that it should be brought to an end." My column today shows the stark differences between the approaches of Garrison and the Post's Shenon. Those concerned about public affairs these days may find it beneficial to explore mysterious current events more in the spirit of Garrison, the only prosecutor who indicted anyone in JFK's murder. "Garrison began by exposing the contradictions in the Warren Report, which concluded that Lee Harvey Oswald was an unstable pro-Castro Marxist who acted alone in killing President Kennedy," according to his biographer Joan Mellen. She is a speaker at the AARC conference and at a dinner meeting Sept. 25 I helped arrange at the National Press Club this week. Her 1996 biography (updated in 2013), A Farewell to Justice, revealed that Oswald (shown during his military service) was no Marxist. She reports that Oswald was in fact working with both the FBI and the CIA, as well as with U.S. Customs -- and that the attempts to sabotage Garrison’s investigation reached the highest levels of the U.S. government. "Garrison interviewed various individuals involved in the assassination, ranging from Clay Shaw and CIA contract employee David Ferrie to a Marine cohort of Oswald named Kerry Thornley, who was also a Defense Intelligence asset," she continued. "Garrison’s suspects included CIA-sponsored soldiers of fortune enlisted in assassination attempts against Fidel Castro, an anti-Castro Cuban asset, and a young runner for the conspirators, who speaks openly here for the first time." Garrison and his investigative team were subjected to a government-organized media smear and prosecution-sabotage effort that is rare if not unique in recent American history. NBA, CBS and other major media ridiculed Garrison and attacked his investigation as preposterous and unethical. He defended it and himself in a July 1967 special report on NBC. The network was required to offer a right of reply under television rules of the time. We now know from released documents and other evidence that NBC's special investigative reporter Walter Sheridan, a former FBI, NSA and DOJ employee, had a close relationship with Robert Kennedy. The fellow Mafia fighters at the Justice Department even shared the same birthday. Sheridan went to New Orleans in 1967 not as reporter or intelligence agent, but as a Kennedy intimate determined to "sabotage" the Garrison probe, according to Kennedy biographer David Talbot in his 2007 book, Brothers. Sheridan's complex motives, Talbot wrote, included loyalty to a Kennedy political timetable for undertaking a new investigation -- and criticism of Garrison's methods, including the DA's focus more on the CIA than Mafia. 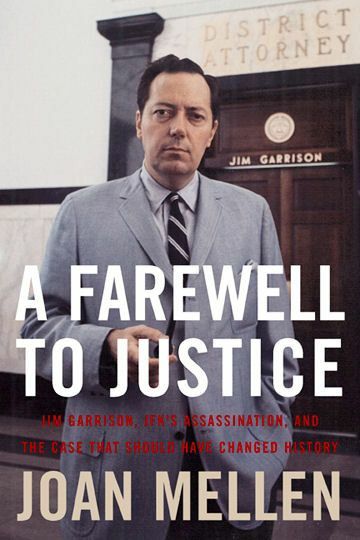 Regarding a more timeless theme of truth-seeking in the justice system wherever the facts may lead,Garrison's dramatic, eloquent response is must-see TV for anyone who wants to understand why the JFK murder remains important today. The people of this country don't have to be protected from the truth. This country was not built on the idea that a handful of nobles, whether located in our Federal agencies in Washington D.C., or in the news agencies in New York, should decide what was good for the people to know, and what they should not know. This is a totalitarian concept, which presumes that the leaders of our Federal government and the men in control of the powerful press media constitute a special elite, which by virtue of their nobility and their brilliance, empower them to think for the people. Personally, I would rather put my confidence in the common sense of the people of this country. As it happened, Garrison's main prosecution witness -- the mob-connected, anti-Castro activist David Ferrie -- died suddenly. By some calculations, 17 prospective witnesses died between the time of JFK's murder and the time of the 1969 trial. A New Orleans jury took just an hour to acquit defendant Clay Shaw of murder conspiracy charges. 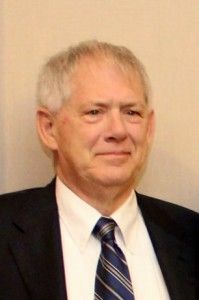 Shaw, shown in a file photo, had denied the prosecution allegation that he was a CIA asset at the same time he ran the New Orleans-based International Trade Mart, a major business that Shaw founded in 1946. Later, evidence has surfaced from many sources that the nation's major news organizations were aligned during the 1950s and 1960s in a CIA network called Operation Mockingbird. Its essence was that owners of the major news organizations -- including the Washington Post, New York Times, CBS, NBC and Time-Life -- would work with agency officials to deliver CIA-friendly messages when especially helpful for national security and similar purposes. In April 1967, the CIA created a 50-page memo, "CIA Dispatch 1035-960." The directive instructed CIA assets to explain to their media contacts worldwide how to defend the Warren Report and attack its critics. The document is here in the original, and here in reformatted text of its summary. This memo initiated the “conspiracy theorist” smear that continues to this day against anyone who speaks against a crime potentially committed by United States government agents working in military, law enforcement or intelligence services. Declassified documents have shown the CIA especially feared Garrison's investigation into Shaw and his activities. Thus the "conspiracy theory" campaign has continued to this day, as indicated by Sunday's Washington Post coverage. The gist is that those who criticize the Warren Commission and such other groupings of eminences are "conspiracy theorists" unworthy of belief or even continued employment in positions of trust in journalism, academia or elsewhere of importance. 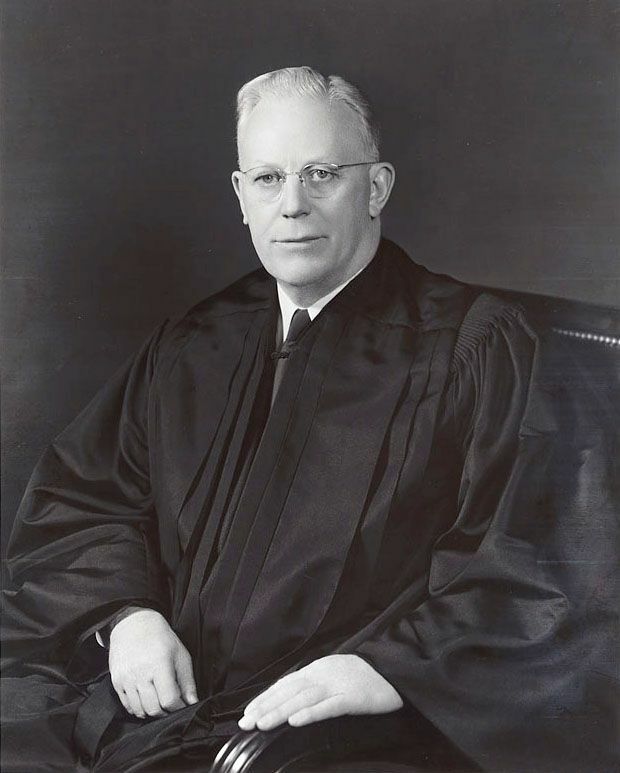 By contrast, the media portrayed the commission chaired by Supreme Court Chief Justice Earl Warren, shown in an official photo, as distinguished Americans conducting the most thorough crime investigation in human history. Furthermore, declassified documents obtained through long struggle by expert critics of the Warren report showed that Shaw, now deceased, had been lying when he denied CIA connections. 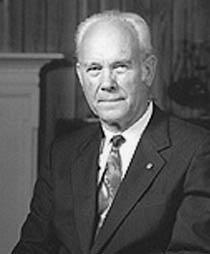 It is now known that "Col. Shaw" had worked with the CIA predecessor Office of Strategic Services (OSS) during World War II and went on to years of covert work with the CIA while running the Trade Mart, a highly influential organization in Latin America and the Caribbean that provided cover for joint intelligence and business goals. Author Joan Mellen, a professor at Temple University and author of 22 books, is among those who have alleged that Shaw, the Trade Mart and affiliated organizations such as the Switzerland-based Permanent Industrial Exhibition (PERMINDEX) were deeply involved in intelligence-oriented assassination and regime-change plots beyond the JFK murder. Her talk at the AARC event is at 11 a.m. Sept. 27. Shortly afterward she will sign books in a room open to the public without conference admission charge, as will a dozen other authors and film makers speaking during the event. Also, she speaks at 6:30 p.m. Sept. 26 at the press club during a Dutch Treat small dinner open to the public. 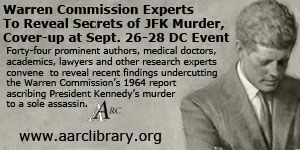 Separate from the AARC conference, the JFK Historical Group has organized a conference "What We Know Now" on the same dates at the Crowne Plaza East Hotel in Alexandria, VA. Some four million pages of documents have been released after the Warren report. But important also is the continued performance of the mainstream media that discourages serious inquiries -- and a federal government that continues to suppress relevant JFK murder documents despite unanimous congressional passage of of the JFK Records Act of 1992, which mandated release of all records. My Readers Guide on this site to the JFK assassination, linked below, showed that virtually all national media still insist on the veracity of the Warren report's core findings. A campaign to release remaining records is a major theme of the AARC and its conference. Its President James Lesar and his late law partner Bernard Fensterwald spent decades in the vanguard of fighting for release of classified documents under the federal Freedom of Information Act and similar law. In theory, the traditional news media should be fighting also to obtain relevant documents and report on them. But Operation Mockingbird and many other patterns show that the media have additional incentives beyond reporting stories, and selling newspapers and ads. Often the top owners are deeply involved with non-news companies, and other business and political goals that included success of affiliated businesses, including lucrative federal contracts whose award depends precisely on the individuals that the news organizations "cover." For example, Eugene Meyer, the patriarch of the Graham family that controlled the Washington Post until last year, was chairman at separate times of both the Federal Reserve Board and also the World Bank. His successor and son-in-law, Philip Graham (1915-1963), was a JFK supporter in 1960 but also deeply involved with the CIA, political intrigues and Operation Mockingbird, according to many sources. Among other media titans of the day were RCA and NBC founder David Sarnoff (1891-1971). Known as "The General" because of his military service, Sarnoff helped staff the National Security Agency (NSA) in the 1950s during a period NSA was so secret that most members of Congress did not know that it existed even though it was funded by the federal government. Dealey Plaza, where Kennedy was killed in Dallas, was named for an owner of radically conservative owners of the Dallas Morning News, George Dealey. His son Ted Dealey became publisher of the newspaper and permitted it to run on the day of the assassination a black-bordered, full-page ad by conservative extremists denouncing Kennedy. Another key figure media figure during the early 1960s was Henry Luce (1898-1967). Groomed as a member of the elite Skull and Bones secret society at Yale, he later founded Time, Life and Fortune Magazines. Luce had a major interest in foreign policy, and is famous for announcing in 1941 that the 20th Century would be the "American Century" -- and using his magazine empire to implement the vision. 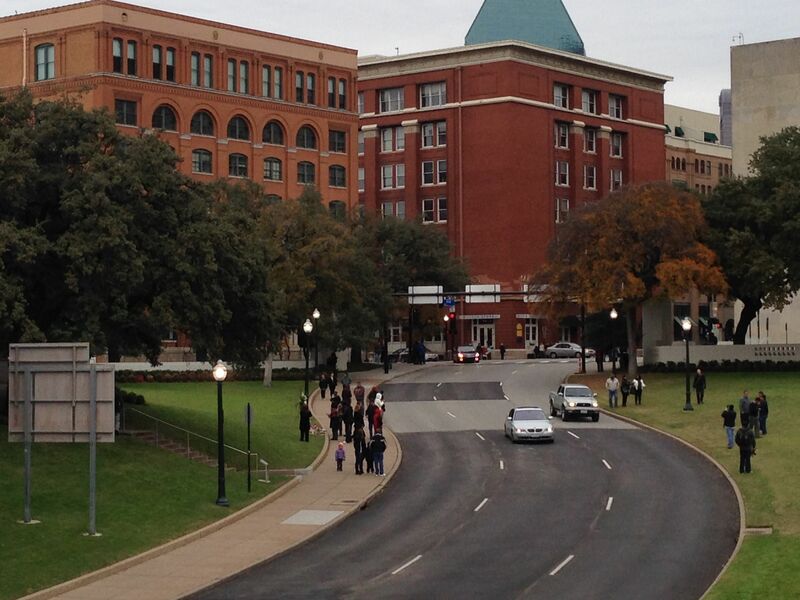 Along the way, one of his staff acquired exclusive rights to Abraham Zapruder's film of the assassination. They occasionally published excerpts and turned it over to authorities on occasion (including for the Warren Report and Garrison's 1969 trial of Shaw.) Time-Life kept the film secret except for these selective uses until pirated copies began proliferating, capped by a nationwide airing by Geraldo Rivera in 1975 on ABC's Good Morning America. Fast forward to now, when the current owner of the Washington Post, Jeffrey Bezos, also leads Amazon.com, which last fall won a $600 million contract to handle advanced "cloud" computing for the CIA. Bezos, who bought the Post for $250 million, last week announced also that he will become a major player in the United States multi-billion-dollar space program. The Post covered that story in Jeff Bezos's Blue Origin to supply engines for national security space launches. Bezos, in other words, is further entrenched as a major part of the nation's military and national security system involving current and potential federal contracts vastly higher than anything subscribers are likely to pay for more thorough newspaper coverage in the Post about such sensitive topics as the JFK assassination. During recent years, the Post has reported in its business pages that its circulation has accounted for just 4% of the newspaper's revenue. Advertising has been about 14 to 15% more, showing clearly that the money is in other realms. Shenon's column must be measured against this background, not just for the prestige of the column's prominent placement in the Post's Sunday newspaper and his column's quite modest level of new information. Regarding Shenon's own background, he obtained the assignment to cover the Warren Commission's historic 50th anniversary after two decades of previous work as a New York Times reporter covering the Pentagon, the Justice Department and the State Department. He is the author of two books, each of which I own for easy reference in this kind of research. In 2008, he published The Commission: The Uncensored History of the 9/11 Investigation. His second book is A Cruel and Shocking Act -- published in 2013 and now being updated -- is subtitled The Secret History of the Kennedy Assassination. In both books, he draws on extensive contacts with government officials, as one might expect. Pursuit of that access to those elites can be a strength, of course, but also a handicap if the end product defers too much to authority. That is exactly what happened with Shenon and the Post in my view, as I wrote in a reader comment yesterday to his column. At the outset, Shenon and his editors suggested to readers that Warren Report researchers could be divided roughly into two spheres: "legitimate" critics -- and the crazies inspired by "conspiracy theories." 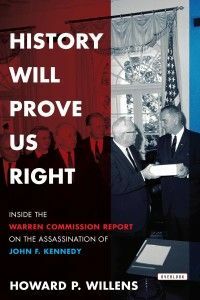 Authorities are standing pat with the main themes of the Warren Commission report, as indicated by the recent book History Will Prove Us Right by Howard Willens, the only surviving member of the three-person supervisory staff of the commission. All of the "legitimate" critics Shen quoted were similar high-level public officials, most of them intimately involved in creating the Warren report. They included the late President Johnson, who organized the commission with a clear-cut mission of finding Oswald responsible with no accomplices. 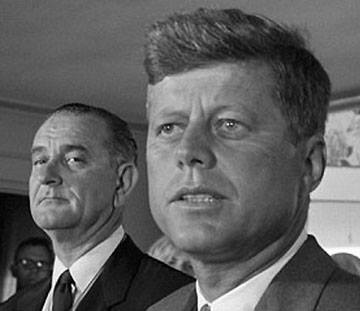 As vice president, Johnson is shown with Kennedy in a widely republished photo at right. Others Shenon quoted as "legitimate" were two former Commission staff members, Charles Shaffer and Burt Griffin, former Attorney Gen. Robert F. Kennedy (whose family silence on the evidence remains the topic of much research), and current Secretary of State John Kerry. Shenon's news peg was that Shaffer has come to believe someone other than Oswald might have been involved in planning the shooting. But Shaffer does not purport to know who it was and, like the others quoted by Shenon, continues to argue that the Commission was correct in its core findings. The CIA had a term for such messaging, according to the longtime CIA executive Victor Marchetti: a "limited hangout." Or, in the iconic police suggestion at accident scenes, "Nothing to see here folks. Move along." This is part of a longstanding pattern. Just three days after the killing, the Justice Department's No. 2 official and future Attorney General Nicholas Katzenbach addressed a strategy message to incoming President Lyndon Johnson via LBJ's key White House aide Bill Moyers, who went on to his current career as a newsman and pundit. Moyers is shown with Johnson in a file photo. In the memo, Katzenbach wrote that the DOJ’s top priority should be to calm the public by focusing suspicion Oswald as a lone killer acting without accomplices .That document, now declassified, is part of the vast evidence that shows the Warren Report was preplanned and inadequate at best, and a cover-up at worst. Allen Dulles, the CIA director whom JFK had forced out with his two top deputies in 1961, was a member of the seven-man Warren Commission. Fifty years later, Shenon and many others are still selling the same tale. Shenon's Post article and book heavily rely on the CIA-generated slur of "conspiracy theory" to smear critics of the Commission. Shenon surely knows better than that simplistic approach. The acknowledgments in his book praise a number of responsible critics, including the AARC, its president and several of its other board members who are presenting at AARC's conference this week in Bethesda. Neither Shenon's article nor his book mention Operation Mockingbird nor those who ran it in the CIA. Nor does he mention any of those with CIA or FBI background have linked to Oswald as likely handlers. In sum, Shenon is like many who find success in ignoring contrary evidence, not in disputing it. As part of my work helping organize the AARC conference in addition to speaking, I invited him and five surviving Warren Commission staffers to speak. All declined. Other possibilities await those willing both to dig deeper and approach evidence with an open mind. The AARC's conference program includes extensive new evidence of CIA involvement in the murder's cover-up at a minimum. The full program is here. My remarks include a discussion about why the murder remains important, and also why the mainstream media cannot bring itself to address the most serious evidence. Those two topics are intimately related. The Shenon column shows that the problems of half-truths and cover-ups are still with us, fostered by talented, well-connected authors, journalists and professors who reap every advantage by ignoring inconvenient evidence. Garrison was New Orleans District Attorney from 1961 to 1973, and was later elected as a judge. Before his death in 1992, Garrison lived long enough to know that the film maker Oliver Stone was portraying him as a hero in the movie JFK. The blockbuster movie was is based in part also on a former high-ranking Pentagon staffer, Col. Fletcher Prouty, shown at left, who wrote two books alleging that the CIA operates in significant part on behalf of what Prouty called The Secret Team of influential financiers who hold unwarranted influence over government, business, the media, and foreign relations in what President Eisenhower had denounced as "The Military-Industrial Complex." Prouty died in 2001 after serving during the Eisenhower and Kennedy administrations as the Pentagon's top liaison for the Joint Chiefs of Staff to the CIA on covert operations. Prouty entitled his 1996 memoir JFK: The CIA, Vietnam, and the Plot to Assassinate John F. Kennedy. Still in print by Skyhorse Publishing, the book argues that the CIA helped mastermind and cover-up the assassination. 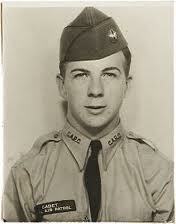 Prouty had been Air Force pilot during World War II and afterwards on highly sensitive missions worldwide. So, he drew on many experiences and was no mere armchair warrior or political appointee. Stone is currently in Germany planning a movie about NSA whistleblower Edward Snowden. Last week, Stone cut a special film message to the AARC audience. Stone's book and film collaborator Dr. Peter Kuznick, a history professor at American University, will deliver the film clip and keynote the conference's banquet Saturday, Sept. 27. Kuznick will show and comment upon the hour-long filmed segment about Kennedy drawn from the Stone-Kuznick collaboration The Untold History of the United States, which is a book and 12-part Showtime series by that name. Kuznick is at the far right of the collage with Stone. 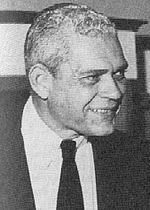 More generally, we do not have to accept all of Garrison's evidence and arguments to assess that he was on the right side of the information wars when he said "the Warren Commission's inquiry into the assassination started off with a completely unacceptable philosophy for a democracy like ours." One of its stated objectives was to calm the fears of the people about a conspiracy. But in our country, the government has no right to calm our fears any more than it has, for example, the right to excite our fears about Red China or about fluoridation or about birth control, or about anything. There is no room in America for thought control of any kind, no matter how benevolent the objective. Personally, I don't want to be calm about the assassination of John F. Kennedy. I don't want to be calm about a President of my country being shot down in the streets. And I don't want to be calm about the fact that for reasons of public policy or national security or any other phony reason, the true facts have been withheld from the people of this country. If the day has come when it is possible to shoot our President down because some men disagree with his foreign policy -- and the day has come that the moment his heart stops beating other considerations take over, which conceal the total truth from the citizens of the United States -- then the day has come when we have ceased to be a democracy. WhoWhatWhy, Coming Up: Russ Baker Speaking at Warren Commission Conferences, James Huang, Sept 14, 2014. WhoWhatWhy Editor-in Chief Russ Baker will be presenting at two Washington-area conferences on the 50th anniversary of the Warren Commission Report. Both appearances will be on Sept. 27. Even 50 years later, the widely discredited official report on the assassination of John F. Kennedy still draws tremendous scrutiny precisely because it failed to solve America’s greatest whodunit convincingly. In fact, more questions and revelations have risen in the half-century since the report purported to give the exhaustive story. Baker’s own investigations turned up new connections and intrigues, which he wrote about in his best-selling Family of Secrets: The Bush Dynasty, America’s Invisible Government and the Hidden History of the Last Fifty Years. Washington Post, Jeff Bezos's Blue Origin to supply engines for national security space launches, Joel Achenbach, Sept. 17, 2014. Amazon founder's Blue Origin signed a deal to put the vroom vroom in national security space launches. Amazon founder Jeffrey P. Bezos popped up in Washington on Wednesday to announce his latest business venture: His low-profile space company, Blue Origin, will supply engines for the rockets that launch America’s military and national security satellites. The announcement, at the National Press Club, featured Bezos, who last year bought The Washington Post, and Tory Bruno, the chief executive of United Launch Alliance, which has a virtual monopoly on the nation’s most sensitive rocket launches. Also on hand: A two-foot-tall model of a rocket engine, the BE-4. The full-size version is about 12 feet tall, Bezos said. Washington Post, NASA goes with Boeing and SpaceX and Blue Origin (Bezos) gets a piece of the action, Joel Achenbach, Sept. 16, 2014. Big news at NASA: The agency has chosen Boeing and SpaceX to carry astronauts to the International Space Station. So reports my colleague Chris Davenport. This keeps competition in the “commercial crew” program. It’s also a major achievement for Elon Musk and the several thousand employees of SpaceX who have turned a start-up company into a major player in the space industry. Some lawmakers wanted NASA to go with a single company — and “Old Space” stalwart Boeing was always a front-runner — but the career folks at NASA who made this decision have opted for two providers, which gives them some flexibility if one of the companies has a major problem. Deadline Hollywood, Joseph Gordon-Levitt Circling Edward Snowden Role In Oliver Stone Film, Mike Fleming Jr., Sept. 21, 2014. Oliver Stone has set his sights on Joseph Gordon-Levitt to play asylum-seeking CIA leaker Edward Snowden in the movie that Stone and his producing partner Moritz Borman intend to shoot beginning in December in Munich. It becomes the latest intriguing role for Gordon-Levitt, who wrapped playing Philippe Petit in the Robert Zemeckis-directed The Walk for Tom Rothman‘s TriStar and is now shooting Xmas with Seth Rogen at Sony. It hasn’t happened yet, but stay tuned. Author Joan Mellen speaks twice this week about her research about the Warren Report's 50th anniversary. At the AARC conference at the Bethesda Hyatt Regency, her 11 a.m. Sept. 27 topic is how CIA and the FBI infiltrated and attempted to subvert the Garrison, Church Committee and House Select Committee investigations into the murder of President Kennedy, as revealed in documents released under the John F. Kennedy Assassination Records Collection Act. The event is at the Bethesda Hyatt Regency Hotel. She signs books shortly afterward. For the past decade, books have cited the Kennedy assassination as an example of "Texas Justice." These works name Lyndon Johnson as the planner aided by his lawyer, Ed Clark, and/or his right-hand man in Texas, soda bottler Clifford Crawford Carter. Malcolm Everett Wallace, a former president of the University of Texas student body and a convicted murderer, is alleged to have murdered witnesses to Johnson's participation in the scams of the corrupt farmer Billie Sol Estes. 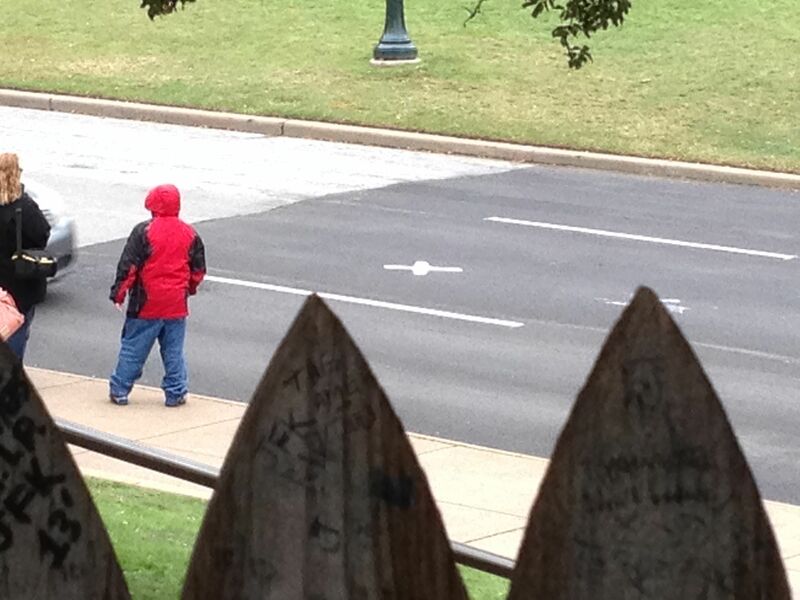 Wallace then was at the Texas School Book Depository on the sixth floor. There is one unidentified fingerprint among the Warren Commission exhibits, and every one of these books contends that it belonged to Wallace. Is any of this true? How is this thesis connected to the other massive evidence about the JFK murder? Joan Mellen is a professor of English and Creative Writing at Temple University in Philadelphia. In 2004, she won its "Great Teacher" award, its highest honor. She has written 22 books ranging from film studies, true crime, Japanese history and cinema, biography and history. Another was a best-seller about basketball coach Bob Knight. She met Jim Garrison right after the Clay Shaw trial. Her biography of Garrison, A Farewell to Justice, is based on more than a thousand interviews. It was published in 2005 and reissued by Skyhorse Publishing with a 90-page update of new evidence in 2013. Her other books connected to the assassination and role of CIA in American political life are Our Man In Haiti, (2012) about Oswald's Dallas handler George de Mohrenschildt and The Great Game In Cuba (2013). Washington Post, Four Pinocchios for Rand Paul’s claim that McCain met with the Islamic State, Glenn Kessler, Sept. 19, 2014. “Here’s the problem. He [Sen. John McCain] did meet with ISIS, and had his picture taken, and didn’t know it was happening at the time.” Sen. Rand Paul (R-Ky.), in an interview with The Daily Beast, Sept. 16, 2014. Just because it’s on the Internet, it doesn’t mean it’s true. Yet here’s a U.S. senator, repeating a rumor about one of his GOP colleagues, as if it were an actual fact. Paul cited it as part of his argument that U.S. funding of attacks against the terrorist group Islamic State, also known as ISIS, will be problematic because it “really shows you the quandary of determining who are the moderates and who aren’t.” The Fact Checker takes no position on whether it is necessary to fund the Syrian rebels. But for the benefit of Paul, and others who may have heard this rumor, here’s what didn’t happen.